Jore Corporation designs, manufactures, and markets power tool accessories and hand tools for do-it-yourself and professional craftsman markets in the United States. It offers hex shank drills, round shank drills, driver bits, drill sets, quick-change systems, and multiple bit screwdrivers. The company also provides custom drilling and injection/blow molding services. It sells its products under private labels to power tool retailers and manufacturers. 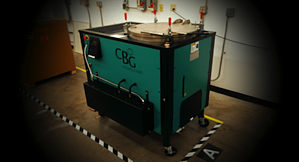 “Since our CBG PW Series Recycler was integrated with our degreaser, our production cleaning process has been greatly improved in numerous ways. With clean production solvent available 24/7, we avoid routine shutdowns to drain our Baron-Blakeslee degreaser and replenish the solvent, which also reduces staff exposure to solvents and repeat runs due to part rejects" said CBG customer Jody Cook, Facilities Engineer, at Jore Corporation. "The labor time needed to make temperature adjustments is less and the heater coils are no longer tasked to heat saturated solvents. This extends the lifespan of the coils, while reducing costly repairs and downtime. The CBG PW Series has provided an array of benefits throughout our company including improved production quality and efficiency, safety, sustainability and significant savings in solvent and disposal costs."